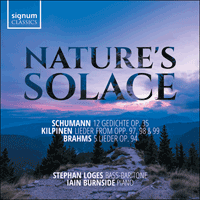 Stephan Loges is accompanied by Iain Burnside in a collection of songs whose texts explore the concepts of lost youth and the transience of life alongside the comforting presence of nature. The programme includes five rarely recorded works by Finnish composer Yrjö Kilpinen. While 19th-century German song composition is probably best associated with the Viennese composer Franz Schubert (1797-1828), his successor and admirer Robert Schumann (1810-1856) brought his own distinctive gifts to the fusion of word and music. Schumann’s commitment to literature was profound; indeed, his fantastical and eloquent music criticism testifies to his abilities, and literary characters are brilliantly interwoven into his early keyboard music. However, it was not only artistic sources that inspired Schumann’s song-writing. Urgently needing to prove to his future father-in-law Friedrich Wieck that he was financially capable of supporting a wife, the piano virtuoso Clara Wieck, Schumann turned to writing songs, for which there was a vast domestic market. By the 1830s, every middle-class household would be expected to have a piano, and the ability to play and sing was a fundamental part of education, particularly for girls. In 1839, the year before his marriage, Schumann and Clara Wieck began a collection of poetry for such settings that they maintained until his death. 1840, his ‘Year of Song’, saw him compose more than 125 songs, and he maintained an impressive rate for the next few years. Not only was this work financially rewarding, but his craft was polished to an extraordinary level through this unstinting practice. Sadly, Schumann regarded song as secondary to large-scale orchestral, choral and stage works, an area in which he strove for success throughout his short life. The settings of verses by the physician-poet Justinus Kerner are not as well-known as Schumann’s major cycles, but the 12 Gedichte, Op 35, composed in late 1840, presents a richly contrasted succession of moods (euphoria, reflection and pathos) and topics (love, loneliness, nature, walking and drinking). After three songs, Schumann had initially declared ‘a small cycle’ finished, but then kept adding more until he had 14 by January 1841 (two were published in miscellanies later on). The songs were so popular that Schumann’s publisher Klemm had to replace the original engraving plates within three years because the originals had worn out. Kerner’s folk-inspired poetry offered an irresistible combination of sentiment and spirituality, what has been called a ‘rapture of melancholy’, rooted in the beautiful Swabian landscape of south-west Germany. The cycle can be understood as a narrative, like Schubert’s Winterreise, offering snapshots of a journey following a heartbreak. Or it can be heard as a carefully constructed set of oppositions. Thus, the dramatic opening ‘Lust der Sturmnacht’ (track 1), in which the poet seeks refuge from the howling storm in his sweetheart’s arms, contrasts with ‘Erstes Grün’ (4) in which the mild spring landscape brings solace to the melancholy poet; this idea of nature as consolation is varied in ‘Sehnsucht nach der Waldgegend’ (5) and ‘Wer machte dich so krank?’ (11). ‘Stirb, Lieb’ und Freud’ (2), one of Schumann’s most moving compositions, describes a devout girl dedicating herself to the church, while her beloved watches helplessly; its expansiveness is matched by the magnificent, harmonically adventurous ‘Stille Tränen’ (10). The German landscape is celebrated in walking and drinking songs, such as the rumbustious ‘Wanderlied’ (3) and ‘Wanderung’ (7); these are contrasted with ‘Auf das Trinkglas eines verstorbenen Freundes’ (6), a patriotic drunken-serious drinking song. However, the closing ‘Alte Laute’ (12) concludes distressingly that the poet can no longer be consoled by nature, but only by an ‘angel’—symbolic either of death’s release, or of true love. Its rumination on the transience of youth and the disillusionment of old age is a foretaste of Brahms’s Op 94 (tracks 18-22). While the 19th century was a golden age for German-language lyric song, this spirit endured in a handful of figures in the following century. Few composers loved the Lied as much as the ‘Finnish Schubert’ Yrjö Kilpinen (1892-1959), who wrote over 700 songs. He studied initially in Helsinki, then in Vienna with Brahms’s friend Richard Heuberger, finally in Berlin, and thereafter enjoyed a distinguished career in Finland. Kilpinen’s posthumous reputation has been clouded by his association with National Socialism, but since his personal documents are unavailable, we cannot know whether he was an actual sympathiser or—like so many—a passive opportunist. He turned to German poetry from the late 1920s to the end of the Second World War. His songs were greatly admired by singers like Gerhard Hüsch and the record producer Walter Legge in the 1930s. Legge (whose wife the soprano Elisabeth Schwarzkopf was herself a member of the National Socialist Party) founded the Kilpinen Society in Britain in 1935. Certainly, the German musical press praised his fusion of the great German Lieder tradition (which was politically misappropriated in those years) with ‘Nordic purity’. However, Kilpinen’s choice of Hermann Hesse’s texts at least prompts a pause for thought, since Hesse’s work was banned by the Nazis by the end of the 1930s. Hesse, who was steeped in world literature, Indian and Chinese philosophy, psychoanalysis and spirituality, evoked a profound response in Kilpinen. His musical style eschews both the lush late Romanticism of, say, Richard Strauss, and the harmonic experimentation of Arnold Schoenberg and the Second Viennese School. He favours starkly transparent textures like open octaves, fourths and fifths (recalling Schumann in track 6), and is truly responsive to the nuanced rhythms and images of German poetry. Like Schumann, Kilpinen preferred to write cycles dedicated to single poets. The selection here, drawn from three opuses, aims for a Schumann- or Brahms-inspired contrast of moods and textures. ‘Ich fragte dich’ (track 13) is a bittersweet, Heine-esque love poem. The text of ‘Allein’ (14) would surely have appealed to Brahms, with its closing declaration that everything difficult must be done alone. ‘Schlittenfahrt’ (15) describes a manic, blizzard-driven sleigh-ride, ending with the poet casting his weakness into the snowy depths; it flows into the exquisite ‘Die Kindheit’ (16), in which the poet addresses a quiet, sunken valley as a metaphor for both love and death. This concludes in ‘Vergänglichkeit’ (17) in which the poet reflects on his grave, and the eternal embrace of the earth-mother. Johannes Brahms (1833-1897) faithfully venerated his mentor Schumann throughout his lifetime. He learned much of his song-writing craft from the older man, including the value of immersing oneself in literature; in his early twenties, he devoured Schumann’s extensive library, copying out dozens of extracts and aphorisms. He also followed Schumann’s practice of carefully maintaining notebooks of poetry for musical setting. This patient investment bore fruit for the next four decades in over 200 songs. His 5 Lieder, Op 94, composed from 1883-4, is suffused with late-Romantic melancholy. By that point, Schumann had been dead for nearly 30 years, and Brahms was no longer an inexperienced youth, but a famous composer, happily settled in Vienna surrounded by friends and admirers. Yet in these songs, he indulged his fascination with the themes of transience (the recollection of childhood in old age, and eventual death) and the despair of loneliness, leavened only with a single—great—love song. The songs were grouped from a larger batch which was divided up into Opp 94-97. Nearly all the songs of Op 94 betray Schumann’s influence, starting with the opening setting of a text by Friedrich Rückert, ‘Mit vierzig Jahren’ (18). Rückert—like Hesse—was a great Orientalist whose reflective, beautifully crafted poetry was adored by both the Schumanns; the song’s bleak opening as the exhausted traveller ascends the mountain is transformed into luxuriant bliss as he finally comes home. Friedrich Halm, the poet of ‘Steig auf, geliebter Schatten’ (19) and ‘Kein Haus, keine Heimat’ (22) was connected to the Schumanns through their friend, the actress Julie Rettich; Halm’s popular theatrical works treated pressing social questions of the day, such as women’s rights and social class, and were much admired by Schumann. ‘Kein Haus, keine Heimat’, one of Brahms’s briefest and bitterest songs, is sung in its original context by a black slave. The poetry of the fine lyricist Emanuel Geibel, poet of ‘Mein Herz ist schwer’ (20) was also frequently set by Schumann, but Geibel’s reputation was declining when Brahms set this song of regret; the composer crafts a virtuosic evocation of Geibel’s native wild, windy North German landscape. Like Schumann, Brahms usually sought to offer a variety of moods in his opuses, so it is unsurprising that he included his ‘Sapphische Ode’ (21). This setting of a text by Hans Schmidt was both a tribute to the young pianist-poet’s skilful handling of the challenging ode form, and a gesture of friendship; it ensured Schmidt’s immortality long after he returned to his native Livonia (today Estonia). How Kilpinen felt about song performance is unknown, although his greatest champion, Gerhard Hüsch, brought loving, sincere attention to each word and full identification with each lyric character, alongside a fundamentally legato, melody-driven technique. The songs of Schumann and Brahms have also attracted many fine musicians who continue to strive to reconcile the inherent contradiction at the heart of the lied: this music is often eminently singable and playable, written ‘for the people’—and at the same time, devastatingly, overwhelmingly intimate. I spent much of my youth devouring Hesse’s novels and have often lamented the fact that his poetry has not been set to music more often—until I came across the songs by Yrjö Kilpinen. Schumann’s Kerner-Lieder, Op 35, completely overwhelmed me when I first heard them many years ago—their melodic and harmonic richness, depth and variety of emotion, challenging compass of vocal tessitura and kaleidoscopic representation of Kerner’s poetic universe makes them unique even within an oeuvre as quirky and diverse as Schumann’s. Johannes Brahms has always had a special place in my heart—I sense in his music so much more the solitary, wide-eyed child and deeply emotional human being, than the Germanic musical titan that posterity has made him out to be; and the thought of recording ‘Mit vierzig Jahren’ at the age of forty tickled my own childish mind no end! The Brahms-Schumann connection is of course an obvious and well-known one, but something in the sparse simplicity of Kilpinen’s compositional style seems to echo late Schumann as well as the folksong settings of Brahms, and in turn makes him an unusual but relevant companion to those two giants of the German lied. While the language of the poetry represented here may sound antiquated to some, its themes of childhood, lost youth, transience of life, the comforting presence of nature, love, loss, grief and death are as modern and relevant as ever, and as heart-breaking. Great singers of the past have always been an inspiration to me, and some have certainly played their part in the birth of this recording. There are sadly no recordings of Brahms’s favourite baritone Julius Stockhausen, but since his consummate artistry and friendship with Brahms lie at the heart of so many of Brahms’s songs and love of lower voices, and Op 94 was written entirely for low male voice, recording it is a way of paying homage to this fruitful partnership. Gerhard Hüsch was the first singer to champion and regularly perform Kilpinen’s songs and recorded them for HMV in 1935 with the composer’s wife Margaret at the piano. Thomas Hampson’s recording of Schumann’s Op 35 with Geoffrey Parsons was my introduction to this music and is full of youthful exuberance, awareness of every poetic nuance, and an astonishing variety of vocal colours; and José van Dam’s recording of the same piece is unsurpassed for its sheer vocal beauty. Every generation of singers will have its own justified reasons for wanting to add their voices to the already existing canon of song recordings. Making a recording is a fascinating process, but at times also a very frustrating one: (almost) alone, without a physically present audience but surrounded by cables and microphones, the resulting obsessive attention to detail and striving for technical perfection can easily culminate in an unhealthy act of navel-gazing. But at best it is a snapshot of one’s love affair with certain pieces of music, one’s personal take on them, an opportunity to take musical and emotional risks, and a chance to connect with an imagined audience, to bare one’s soul in the hope of reaching the unknown ‘other’ somewhere out there. My heartfelt thanks to Iain Burnside, Steve Long, Mike Hatch, Raphaël Mouterde and everyone at Signum Records, and to my wife Natasha—none of this would have been possible without their help, patience, artistry and kindness.